The National League for Nursing (NLN) TEQ Blog is a resource for nurse educators and faculty who want to stay up to date with innovations in simulation, e-learning, telehealth, and informatics. It is managed by the NLN Center for Innovation in Simulation and Technology. Their latest post, Ace.P Unfolding Case – Thomas Sykes, presents a pediatric case study focused on a community approach and provides free resources for download. Another post discusses findings from a national survey on tech growth in nursing education. Check out the wealth of resources for nurse faculty on this site at nlnteq.org. To request an exception for teaching or administrative purposes, contact Jay Johnson (.1043), Associate Director of Institutional Research and Planning. ~ How do VPN and the Remote Desktop really work? ~ What are the differences between our CON network drives? Which ones can I access and when? ~ Why can’t I keep things on my own desktop on Remote Desktop? Why shouldn’t I keep a bunch of files and folders on my own computer desktop? ~ How does Duo work? If you missed his half-hour webinar, you can view the recording online. He displayed a pair of great side-by-side diagrams illustrating the difference between our Remote Desktop and VPN. Here they are! 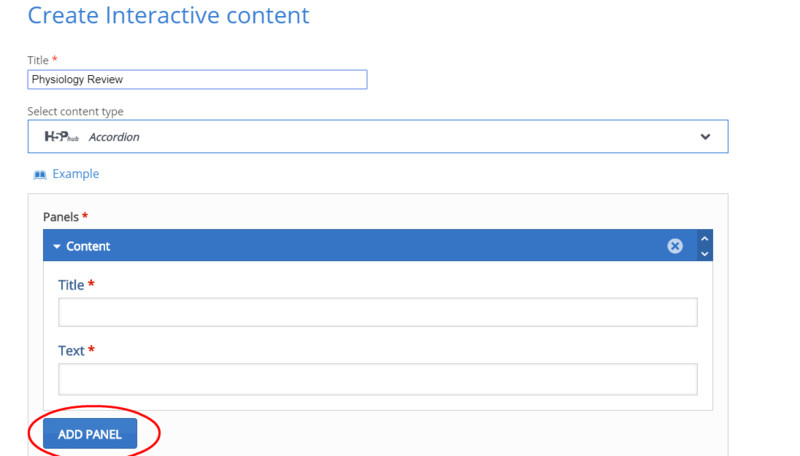 The previous blog entry showed how to make a basic accordion style review tool on H5P. 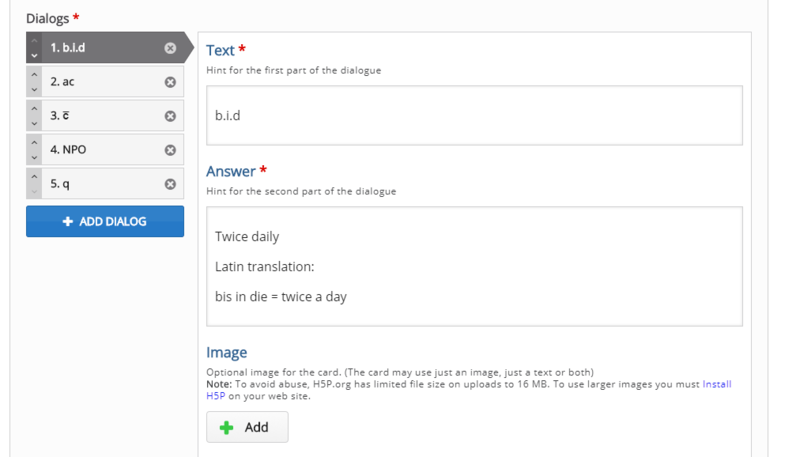 This entry will teach you how to use H5P to create online flashcards. 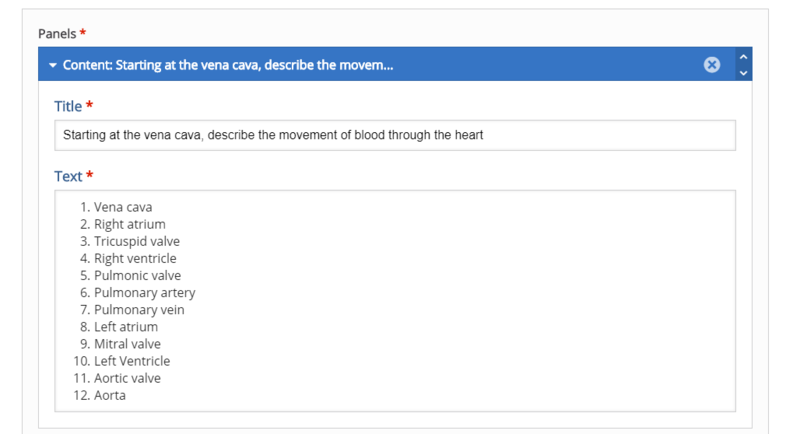 The online flashcard tool is a great way to present a large amount of study material, as long as the material requires only a brief explanation or rationale. The process is a bit more complex than the accordion style list, but the outcome is much more customizable. 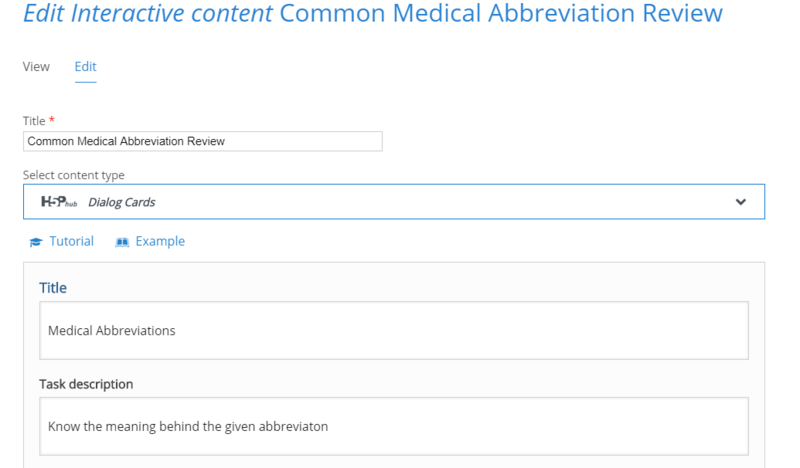 Below is an example flashcard set to study commonly used medical abbreviations. Most of these cards are simply text on both sides. Cards 3 and 4 give examples of how to use audio and image clues on a flashcard set. 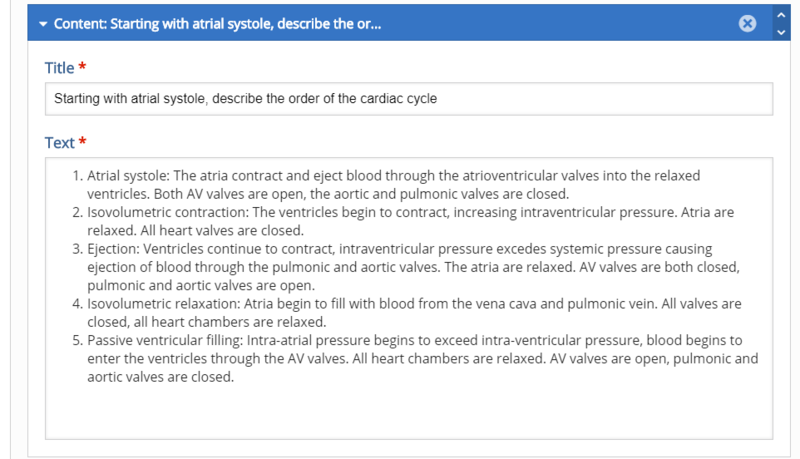 To create a flashcard set, start at the H5P content screen (you will need to create a free account) and select “dialog cards” from the drop down menu. These first dialogue boxes will set the title for your project, the title that appears at the top of the card pile, and the general instructions for the card pile. 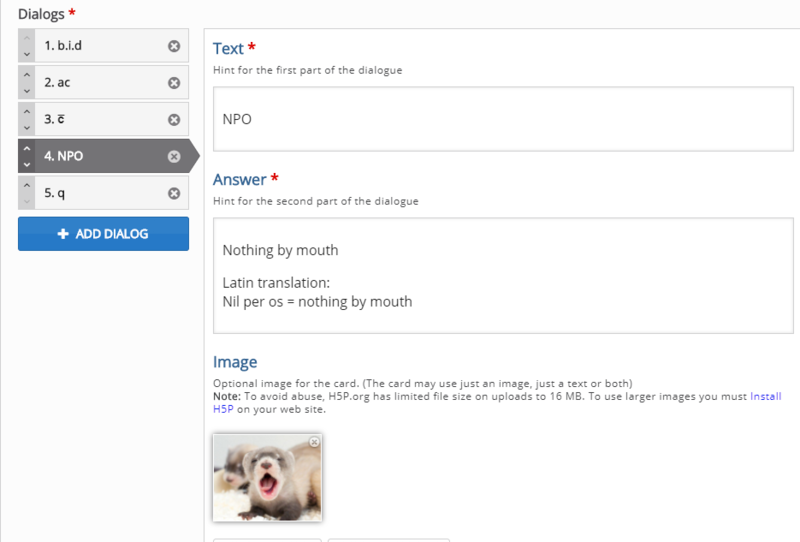 The first dialogue box for your card will determine what shows on the front of the card. The second dialogue box shows what will appear on the back of your card. Initially, you will only have one blank card. To add more cards, you must click the blue “add dialog” button on the left menu. Card 3 is unique in that I added an audio clue to the card. To do this, scroll down until you see the section for “audio files” then click on the grey rectangle to upload your audio file. You can upload audio files with a URL or from uploading a saved MP3 from your computer. It’s also possible to record your own audio files to upload. It’s important to be aware of any copyrights your file may have, and to cite them properly. Citations will appear in the “Rights of Use” button on your flashcard set. Card 4 is unique because it has a visual clue that appears on the card (images will appear on the front and back of the card). 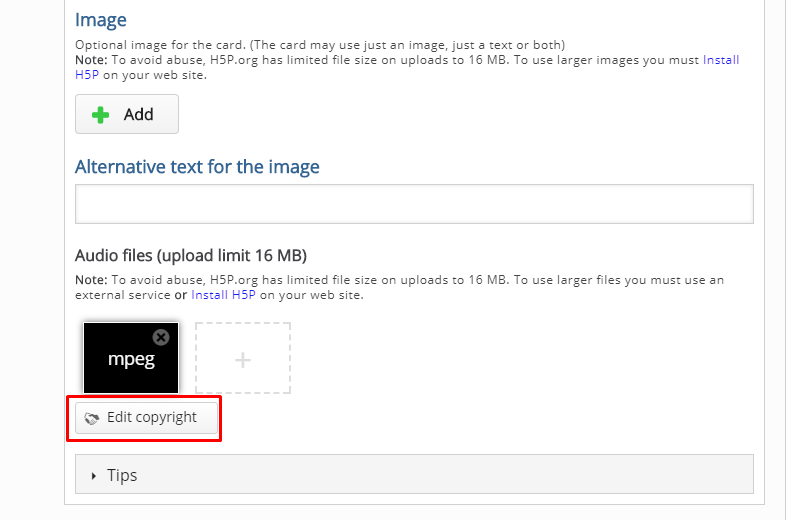 Images are uploaded just like audio files, except you will upload images under the “image” section. Just like audio files, be aware of the copyrights your image may have and cite them properly. At the bottom of the page you will have the option to further edit actions and behaviors of the card deck. For this tutorial I left those options as default, but I encourage you to play with them and contact CON IT for any additional assistance you may need. You will also have the option of editing what buttons will appear on the final flash card deck. Once you are satisfied with your flashcard deck, click the pink “save” button. If you followed the directions posted here, you should end up with a deck identical to the one at the top of this blog post. For help configuring your deck, or assistance in implementing flashcards in your classes or study groups, please contact CON IT for additional assistance. The creation of an accordion list is quite simple. Follow this link to get to H5P’s content creation page (you will also need to create a free account). Once there, click on the bar in the center of the page labeled “select content type,” and “accordion” will be the first choice. After selecting “accordion” and clicking the blue “use” button, you will be presented with a blank template. In the image below I have given the list the title “Physiology Review.” The current template has one blank form. To create a second blank form, you will need to hit the blue “add panel” button (circled in red). If you want to add more content, you can continue to add more panels by clicking the blue “add panel” button. If you want to edit the display buttons on your accordion list, you can do so with the check boxes. If you are finished and want to see the completed list, click the pink “save” button. Saving will take you to a finalized version of your accordion list. If you want to make edits to your list, you can do so by clicking the “edit” button. If you want to download a copy of your list or get the embed code, you can do so by clicking the respective buttons. If you don’t want the option to have download or embed buttons, you can remove them by deselecting the check boxes on the previous screen. For assistance using the H5P accordion list in your classroom, please contact the CON IT Department for support. 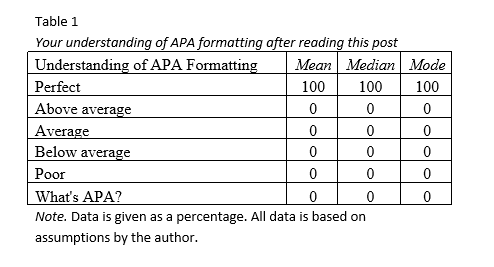 This post will provide a walk-through for citing digital media using the American Psychological Association (APA) format. This is the most common citation style for scientific papers. Proper citation is important in that it gives credit to the original authors and owners of referenced works, and it gives readers of your paper a way to research and verify the sources that you used. Include the word Table with its number next to it (starting at 1) and a title which describes the contents of the table. Title should be in italics and capitalized in sentence case. A table should be able to be understood on its own, even outside of the context of the rest of the paper. A note under the table can be used to provide extra information and context. Some web resources may choose to include their reference list without the usual APA-style hanging indent because hanging indents will not display correctly on certain blogs and web platforms (See an example). The reference entries you see above are image files intended to demonstrate how hanging indent should display in APA style. You have probably been told in the past not to click links in emails from unknown sources, and you probably follow that rule to the letter. Phishing attempts become more legitimate-looking every day. Below are some recent examples that faculty and staff at the College of Nursing have reported. Click on the image to view it full-size. This email has been flagged by the administrator as a possible phishing attempt (red flag #1), and if you hover over the link without clicking, you’ll see it does not go to a osu.edu webpage. Also please note the convincing-looking signature line, and the very suspicious line above this assuring you that it is legitimate. See that the link above does not lead to my.osu.edu, and note the grammatical errors in the email. The above email contains a link that does not lead to a osu.edu page. It also contains questionable grammar such as “All staffs and students” and “portal to access the below”. The link in the above email does not seem legitimate, and the “From” line of the email seems odd too, as it does not have an email address but only a name. I looked up the sender below for more information. It turns out, the “sender” is a real OSU employee, but if you notice in the original email, the “From” box has a comma between last name and first and in the center of the email the comma is missing. If you do not know the sender or you are not expecting an email from them, assume this is a phishing attempt. Sometimes it helps to do a Google Search or a “Find People” search on the sender of an email. Above is what I found out about “Wilhem Veen,” a name which appeared numerous times above. To get started with Office 365 for faculty and staff, refer to the Office 365 Employees article as well as the FAQ for employees on Office 365. For information on the data that can and cannot be placed in OneDrive for Business, consult the Ohio State Institutional Data Policy.To access Office 365, use the office365.osu.edu webpage. 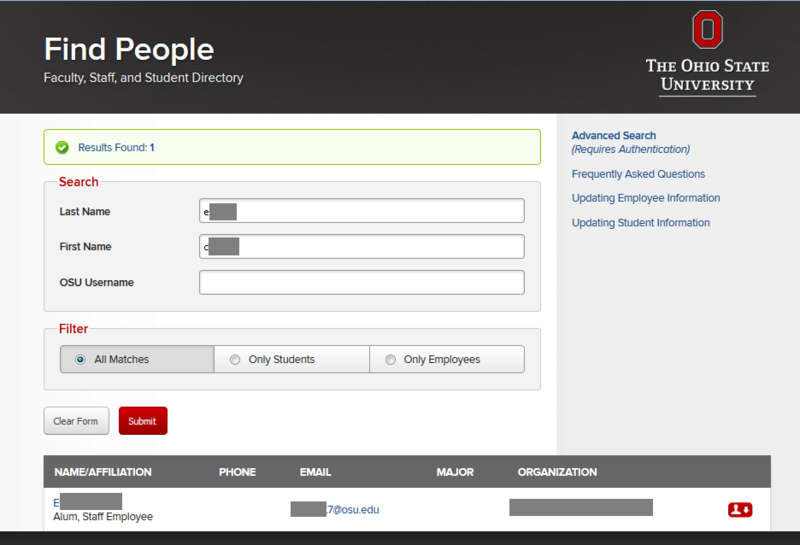 To log in, click the ‘Faculty/Staff’ button and use your lastname.#@osu.edu and password. If you are a student as well as a university employee, you will have two Office 365 accounts: for one, you will use your lastname.#@osu.edu to log in, and you will use your lastname.#@buckeyemail.osu.edu to log in to the other. It is important to note that if an employee is also a student, they will have two separate and unique accounts, one for employee work and one for student work. They must log into each separately. To install Office 365, refer to the Installation of Office for Windows/Mac for Employees Knowledge Base article. Note: Office 365 should NOT be installed on any Ohio State-managed equipment. Employees must contact their local IT before attempting an installation on university managed computers. In our first two posts about Cybersecurity, we defined different threats and discussed what the College of Nursing IT department does, as well as what you can do, to protect our data at the College of Nursing. This post will go over some additional information about reading website addresses that will help you to be safer when browsing the web. Below in black/blue/red/green you can see the full web address of the RN to BSN program introduction on the CON website. You will notice four distinct parts of the address. Below, we will go over those parts of the web address. Http(s): The letters “http” ahead of a website signify the Hypertext Transfer Protocol, and the “S” added here indicates that the connection is encrypted (or, coded to keep unauthorized viewers from seeing the information being transferred). Domain: The domain name is the name of the website that you are accessing. In the case above, nursing.osu.edu is the domain name of the College of Nursing. All of the subsequent pages that you can reach from the College of Nursing’s website are “nested” into this domain. In this particular case, nursing.osu.edu is connected to the overall osu.edu domain which you can reach by clicking the link at the very top of the page. 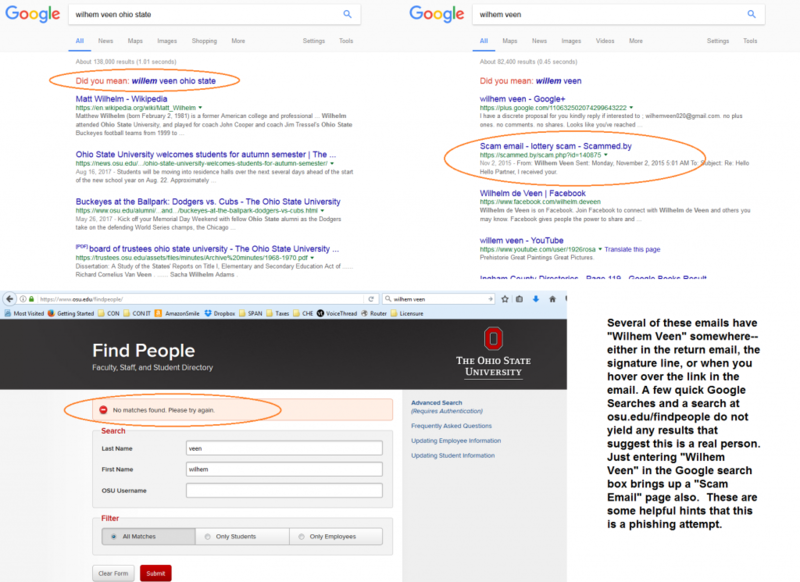 In much the same way that books have chapters with sub sections, the larger “osu.edu” domain connects to the smaller “nursing.osu.edu” domain which has many pages attached to it. Extension: The extension tells us what kind of website we are accessing. In this case, the “.edu” extension indicates that this is a higher educational institution. Other common domain names are listed on this Wikipedia page. It’s good to be familiar with the most used extensions, because in recent years, fake websites have popped up that may lead you to think they are legitimate. For example, the real website for the ABC News television station is abcnews.go.com. Recently, a fake site popped up with the web address abcnews.go.co* (notice this site ends with “.co” instead of the usual “.com”) that mimicked the real website quite convincingly. Path: The series of words with forward slashes that follow the website extension tell your computer where to look in the domain of the website– this is basically a nested series of pages. So, in the example above, the RN to BSN program introduction connects to the undergraduate program overview page which can be found on the academic program page. *For those of you who are now terrified of clicking on a bad link, we’re glad you’re paying attention! The link above to the fake ABC website will just take you to a Wikipedia page describing the site, so feel free to check it out this time.